Two Palestinian teenagers have been arrested on suspicion of carrying out the brutal murder of an Israeli settler family while they slept in their home. Amjad Awad, 19, and Hakim Awad, 18, from the West Bank village of Awarta, are reported to have confessed to murdering Udi and Ruth Fogel and three of their young children, police said. They were stabbed in the nearby settlement of Itamar on 11 March. Police released details of the suspects after a gagging order was lifted. Spokesman Micky Rosenfeld described the attack as planned and executed by the two teenagers, although he said five other family members were also being questioned. "The two planned and carried out the attack with knives, they first killed children Yoav and Eldad before moving into the parents' bedroom and killing them and baby Hadas who was sleeping with them." Israeli security officials arrested scores of people in the days following the killings, although most were eventually released. Investigators arrested Amjad Awad on 5 April, a report in Israel's Haaretz newspaper says, with Hakim Awad (no relation) detained five days later. Both are reported to have confessed quickly to the murders and to have shown little or no remorse, Haaretz reports. The pair have links to the Popular Front for the Liberation of Palestine (PFLP), Israeli officials say, a militant group which has carried out attacks on Israelis in the past. However, investigators from Israel's domestic security service, Shin Bet, have not formally linked the PFLP to the planning of the attack on the Fogels. With the lifting of the gagging order, though, more details have emerged of how the killers infiltrated Itamar, a settlement located some 5km (3 miles) south-east of the Palestinian city of Nablus. The two suspects are said to have travelled from Awarta after dark on 11 March, cutting their way through Itamar's security fence and stealing an M-16 and ammunition from an empty house. At the Fogel home two children - Yoav, 11 and Elad, four - were stabbed and killed after being seen in the window. Parents Udi, 37 and Ruthie, 36, were next to die, stabbed and killed despite a struggle in their bedroom. Ruthie was also shot, Haaretz reported. The youngest victim, three-month-old Hadas, was killed last when she was spotted by the killers on their way out. Two other children, Roi Fogel, eight, and Yishai Fogel, two, were unharmed. The bloody scene was discovered by another child, 12-year-old Tamar Fogel, as she returned home later in the evening. 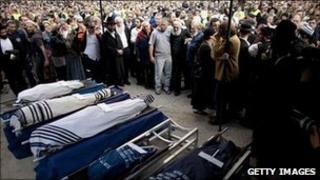 The murders were greeted with revulsion in Israel and were condemned by Palestinian leaders as well. Palestinian Authority President Mahmoud Abbas called them "immoral and inhuman". There are almost 500,000 settlers living on occupied Palestinian land in the West Bank and East Jerusalem. Settlements are regarded as illegal under international law although Israel disputes this.